Time lapse confocal imaging has been an essential method to investigate the 3D dynamic behaviors of cells in tissue cultures. For long-term live cell imaging, it is critical to reduce phototoxic damage to the cells caused by repeated laser scanning. 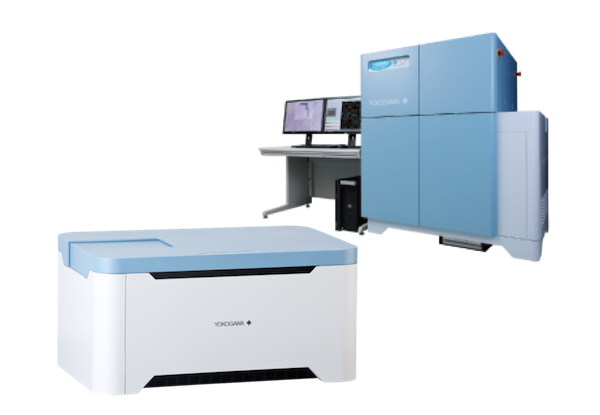 Yokogawa CSU (confocal scanner unit) is a confocal unit using a microlens-enhanced dual Nipkow disk confocal optical system, which has been shown to be less harmful to living cells compared to conventional single beam scanning devices. The CQ1 is an all-in-one confocal quantitative imaging cytometer based on the CSU. 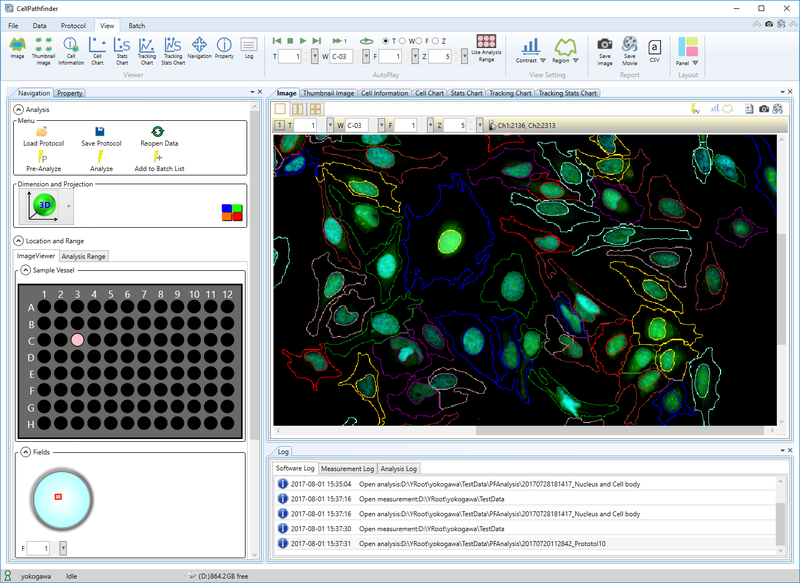 Here we report the 3D time lapse live cell imaging in a multilayered cell sheet using CQ1. Five-layered myoblast cell sheets were constructed from human skeletal muscle myoblasts (HSMM) and human skeletal muscle fibroblasts (HSMF) . Human umbilical vein endothelial cells (HUVEC) expressing GFP (GFP-HUVEC) were overlaid by the cell sheet and co-cultured. Time lapse imaging (67 hours, 30 min interval, 40x objective lens , 49 fields) was performed by CQ1 equipped with an internal incubation chamber to regulate culture environment. Fig. 1-1. Time lapse images of the cell sheet. Images were reconstructed of the field indicated by the yellow frame in the large field stitched image in Method fig.2. Fig. 1-2. Migration of the GFP-HUVECs into the cell sheet. Single slice images showing the migration of HUVECs into upper layers. (Rows, from top to bottom) Single slice images of layers 3, 2, 1 and corresponding Y-Z plane images of the cell sheet. (Columns, from left to right) Images acquired at 0, 17, 34 and 51 hr incubation. The image filed is the same as fig. 1-1. Fig. 2. Temporal change of the distribution GFP-HUVECs in the cell sheet. GFP fluorescence intensity in each layer was indicated as the ratio against the total GFP intensity in the cell sheet. GFP-HUVECs dynamically migrated upward into the five-layered cell sheet constructed from HSMMs and HSMFs. The GFP-HUVECs formed a reticulate network in the horizontal plane in the middle layers. Long-term 3D time lapse imaging by CQ1 revealed a dynamic process of the active migration and the formation of the cellular network in the multilayered cell sheet. CQ1 would be a powerful research tool in tissue engineering as well as regenerative medicine and drug screening.